There`s a number of reports that are used in various departments of an organization. These reports basically present the appropriate content in a simplified format. The main advantage of presenting information through a report is that the data can be accessed quickly and with ease. The most important thing for today’s dynamic and fast moving businesses is that every task needs to be done in time as the delay in completion of a task may lead to loss of money, reputation or both. The same thing applies to reports also which need to be submitted in time to get the process moving at its pace. If you are lacking time and need to develop a report in a limited time-frame, then you will certainly find FastReport v.4.11 a useful application. 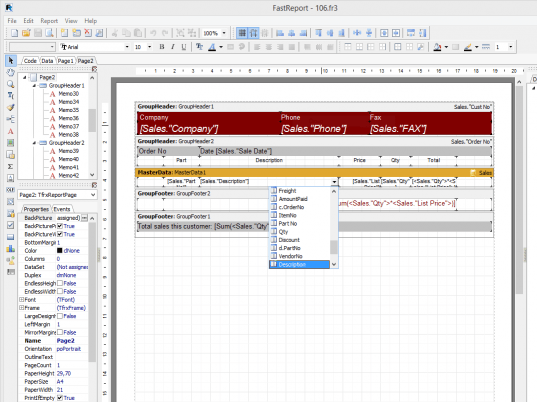 FastReport v.4.11 is a Visual Component Library for designing a report generating application. You can either make a standalone application for generating reports or can integrate a report generating application into any other software. The program has a nice combination of tools for developing reports, which includes a visual report designer, preview window and a reporting core. The interactive program has an intuitive XP styled interface and is equipped with various features for printing the pages with which you can split a big page for printing it in several copies, integrate small pages to print it on single page, duplex handling of pages from print dialogue box, and labeling different pages specifying the copy number. The application contains a wide range of bands for creating different types of reports. This VCL has a built in script engine supporting four platforms i.e. C++ Script, JScript, Basic Script and Pascal Script. FastReport v.4.11 is, overall, a nice application and its features have been appropriately and intelligently designed in order to facilitate quick designing of reports, leading it to score four and a half rating points out of five. Creates data management and editing environments. Scans and logs IPv4/IPv6 network connections.